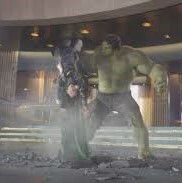 Loki, God of Mischief, once had a very bad day with the Hulk (“Puny God”), way back in the MCU’s 1st Avengers film. This is when our favorite anti-villain was the Big Bad. He’s come a long way since then. We saw, even as late as Thor: Ragnarok, that he’s still terrified of the Hulk, but seemingly more nervous about being melted by the Grandmaster. So when the Grandmaster told him to sit and watch his Gladiatorial Games, he sat, even though all the color drained from his skin and he fidgeted unconsciously. Fans of the Marvel Cinematic Universe knew where his discomfort arose, and smiled inside, remembering Tony Stark’s one-up line to Loki’s Chitauri Army boasting (“We have a Hulk”). It’s not everyday a god gets beaten to a pulp. In Ragnarok, we see he didn’t forget it. 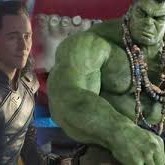 So it came as a nice call back when Loki joined up with his brother Thor and the Revengers, gloating to Thanos, “We have a Hulk.” It’s a great moment that should have paid off in Thanos getting smushed into gravy. Except it didn’t work that way. Loki had one small moment to feel excited about being on the same side as his brother, but it didn’t last long. Thanos smashed up the Hulk himself, with no weapons sans fists and attitude. Thanos clearly was never in danger, and as the Maw said, “Let him have his fun.” [pullquote]Loki paid for that mistake a few moments and one miscalculation later [/pullquote](“No more regenerations.”) Sadly, I suspect this is one death that’s going to stick, whatever else happens with the Snap-apocalypse. Loki does stand up to Thanos, gets over his fear of the Hulk, and dies a hero’s death (he’d be headed to Valhalla if there were any sober, working Valkyrie left). Loki, you are already missed. So what’s the deal with the Hulk? Once he gets the snot kicked out of him on the Asguardian ship, he’s flung to Earth, and spends the rest of the movie in hiding. [pullquote position=”right”]Hulk won’t come out, no matter how much Bruce Banner begs, pleads, demands, or hits himself trying to get angry. The Green Guy had enough of Thanos and his ilk and is…what…afraid? [/pullquote] Why is he afraid now? He’s been smacked around before, as recently as on Asguard in the Ragnarok. But that was against some kind of immortal giant. Thanos is his own size. I think it comes as a huge shock to Hulk that he could be flung around like a rag doll, the way he’s used to doing the flinging. So, yeah, he’s afraid. Which is an interesting point. Loki, like his brother Thor, was thousands of years old. He was mature enough to legitimately grow out of his Hulk fear. But Hulk is basically a toddler. Put together all Hulk’s time on the mortal plane and it equals not much. Maybe two years on Sakaar, plus a little time here and there on Earth, when Banner wasn’t trying to keep him bottled up. He’s a child. A big green whiny baby. It’s not even his fault. [pullquote]This isn’t to denigrate Hulk’s Avenger status. But it seems he needs to have his sulk and work through it. After all, it wasn’t until his time on Sakaar that he really learned how to talk, or play nice with others. [/pullquote]And he probably HATES Banner, who will be the reason for Hulk’s death one day (due to old age), and who only lets him out when there’s someone to be smashed. In essence, Loki got to have a mature arc at the end of his millennial life. He got over his Hulk fear and sacrificed himself for the good team. Hulk is still just too young to understand much of anything — plus, rage makes it hard to think straight. He might need to take some time on Earth (the place he said everyone “hates him”) as himself and do a walkabout, smell some flowers, have a picnic with Black Widow…basically, Banner needs to let the Hulk out of his cage. The two need to come to terms with their shared life. Once this happens, Banner can leave the Hulkbuster suit behind and let his rage monster do his thing. I don’t see any other solution. And while I feel bad for the Hulk to be so afraid, I feel worse for Loki and for ourselves. RIP, Adopted Odinson, God of Mischief. That’s so true. I never considered that Hulk can’t really draw on Banner’s maturity at all. They are truly like two separate individuals and Hulk starts out day one as an infant and then matures only when he’s in charge. I’m guessing that the comics may make this more apparent. Maybe someone will comment here and clue us in on that. I bet that’s true about the comics. There’s a lot of backstory we could probably pick up on all the heroes that way. But then there are so many different concurrent stories and timelines that it’s impossible to say what’s cannon, I’m guessing. Like Red Hulk, and Planet Hulk — two things I’ve heard mentioned here and there. I think the Banner/Hulk dynamic is one of the most interesting. Hulk is so impervious to everything…but when Banner ages and dies, Hulk will probably die too. Hulk probably fears Banner more than anything else. Possibly we’d end up with a full time Hulk, though – this IS fantasy. Or maybe there is a way to separate them into two individuals. But then, that would be a boring solution. I also find Hulk’s friendship with Valkyrie intriguing. It had a sibling flavor. I’m very curious why she wasn’t on Thor’s ship and where she and the rock guy got themselves off to. I hope this gets picked up on with the 4th Avengers film.